Scrounging through the toy stores always turns up interesting modeling subjects. 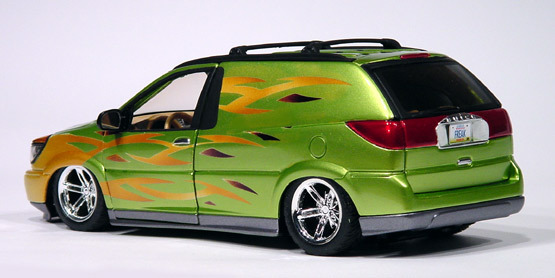 At a Toys-R-Us I stumbled across this 1/24 scale Maisto Buick Rendezvous die-cast replica. My first thought was, "what a waist of tooling dollars." Of all the cars that could have been made into a model, why pick this one? 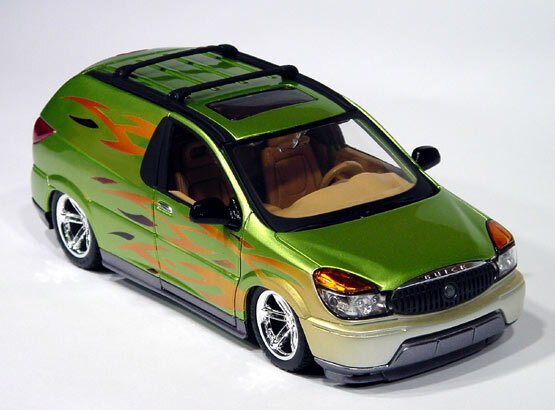 I happen to think the real 2001 Buick Rendezvous is pretty ugly. (Sorry, to offend anyone who owns one.) My second thought was, "hey, this is actually a nicely done model and maybe it would have some potential as a project." 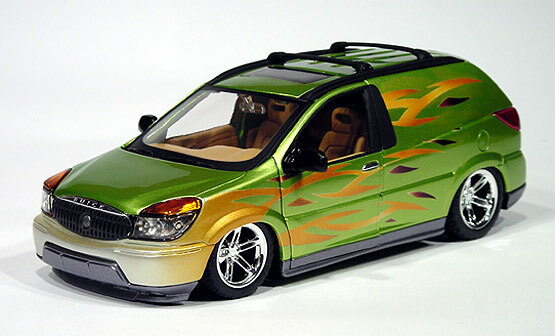 I tend to believe that with the right amount of customizing any car can be made into something cool. So I went ahead and bought it. It sat around for a couple of months on my work bench and then day it hit me that it would make a cool panel van. After carefully disassembling the replica, I soaked the body in lacquer thinner for a day to strip the paint. One nice thing about working with die-cast models is that it is very easy to strip the paint. After soaking in the thinner, the paint just slides off the die-cast body. Don't try this technique with a plastic model! Next, the back windows were glued into place and auto body filler was used to smooth over the windows and rear door lines to convert the body into a panel van. Also, I thought the front end looked kind of busy, so I filled in the recessed fog lights that had been in the front bumper for a smoother look. After the body work was finished I laid on the new custom paint. 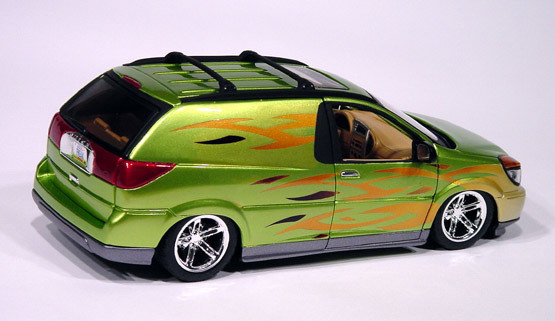 I was original thinking this would make some kind of cool surf wagon so I decided to go with a tropical theme for the paint. For the colors, I custom mixed a candy lime metallic green and applied it over a white base coat. It looks a little washed out in these photos, it's actually brighter in real life. Using an airbrush I applied the tribal-style flames which fade from a pearl white at the front to various shades of candy orange and raspberry. Afterward, the whole car was shot with PPG Concept 2000 urethane clear. The interior was repainted with my own custom mix of tan. Finally, I reassembled the model with a slammed suspension and added the wheels and tires from a Maisto Chevy SSR replica.